Scientists don't know for sure how these boulders got to their exceptional location - they couldn't have rolled uphill to the top of the cliff; there's no higher cliff from which they could have fallen - but they suspect it has something to do with the Atlantic Ocean far below them. 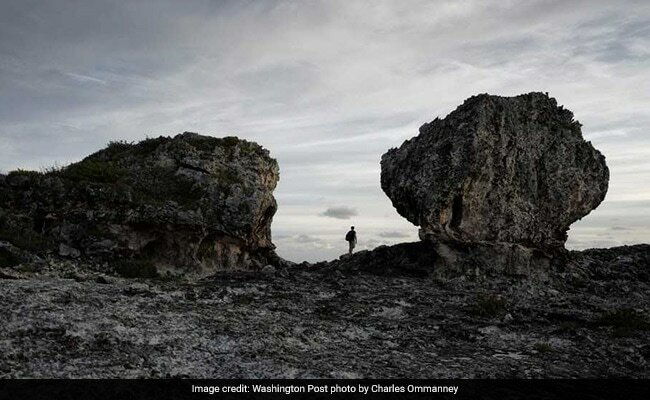 The giant boulders of Eleuthera, Bahamas, known as "The Cow and the Bull"
Atop a jagged, 50 foot high cliff on the Bahamian island of Eleuthera sit two enormous boulders, known as "The Cow and the Bull." Each is several times taller than a person; the squatter and wider of the two, the 'Bull,' weighs around a thousand tons. The boulders are a tourist attraction, but in recent years, they've become much more than that - a scientific mystery that has been intensely scrutinized because of the lessons it could hold about climate change. One possible explanation has frightening implications for the present. Two years ago, famed climate scientist James Hansen, drawing on the work of the University of North Carolina at Wilmington geologist Paul Hearty, suggested they had been put in placeby catastrophic superstorms more than 100,000 years ago, at a time of higher seas and dangerous weather dynamics. These conditions, Hansen fears, could return again if polar ice sheets melt rapidly, upending ocean circulation and potentially causing a host of other difficult-to-predict scenarios. A new scientific study, however, counters that while the boulders were indeed probably put in place by violent waves long ago, it wouldn't have required superstorms to get them there. Published Monday in the Proceedings of the National Academy of Sciences, the work by Alessio Rovere of the University of Bremen and Leibniz Centre for Tropical Marine Research and his colleagues suggests that even storms of today's strength could have moved the boulders - at least back when seas were 20 to 30 feet higher, as they were during part of the Eemian warm period, circa 125,000 years ago. The new study, though, could hardly be called good news for those who will live with the consequences of climate change. It uses the boulders to underscore the lesson that as seas rise once again in our future, they will be able to unleash even more of the ocean's destructive power upon present day human structures. Storms won't even need to have stronger winds - the oceans will do much of the work. "As soon as you start rising sea level, you have higher energies on that cliff," said Rovere, who conducted the new research with scientists at institutions in Germany, the U.S., Australia, New Zealand, and the Netherlands. The controversy over Eleuthera's boulders underscores just how little we know about how the oceans will react to climate change. The seas are rising, but only relatively slowly so far - we don't know how much this could speed up. And as they warm up they may also foster more intense hurricanes or perhaps even other kinds of large scale storm systems. Early reaction Monday's paper, however, suggests the ongoing debate over the mysterious boulders of Eleuthera is unlikely to end any time soon. Hearty and Hansen believe that during a period of dynamic climate transition over 100,000 years ago, enormous storm waves swept the boulders upward from a lower and older cliff face. Other boulders on the island of Eleuthera, Hearty suggests, were carried even farther afield. Hearty believes this is part of a "trilogy" of evidence of disastrous change on Eleuthera at the time. He also argues that small bubbles from vast waves were left as high as 80 feet above sea level on the island, and that long and angled rock walls farther inland, which Hearty calls "chevrons," represent ancient sand dumps from these waves. Rovere and his colleagues traveled to Eleuthera in 2016 hoping to investigate Hearty's hypothesis, and to add some mathematics and computing power to the endeavor. So they used a photographic algorithm to estimate the weight of the rocks (the Cow, they found, weigh 383 tons; the Bull they estimated at 925), and boat measurements to determine the shape of the seafloor offshore, which drops off very quickly into extremely deep waters - a phenomenon that helps the ocean funnel its energy at the cliff. However, three experts on the geology of the Bahamas - including Hearty - contested aspects of the new work, while praising some others. Hearty said the new work "contains important technical observations that shed some light on the physical characteristics and mechanisms of transport of the megaboulders," and noted that it "supports wave transport of the boulders by storms, as we have maintained since 1998, despite many challenges." But he noted that the boulders are only one part of the evidence that he has adduced to support the superstorm hypothesis. And he posed this question: If storms of the present are powerful enough to move rocks this big, "then why aren't there many Holocene and historical boulders at lower elevations as large as the megaboulders?" John Mylroie, a geologist at Mississippi State University who has also studied the rocks, added that during the Eemian period long ago, the cliff face was different than at present - jutting farther out into the sea, and with higher cliffs - which he believes poses a problem for the calculations. "The authors have accounted for the +6 m sea level position 120,000 years ago, but not for how the coastline was configured at that time," said Mylroie by email. This means, he said, that "more energy would have been needed than they calculated." Pascal Kindler, a field geologist at the University of Geneva who has studied the rocks, also questioned the analysis. On the one hand, he noted that the 'Bull' is actually made up of three separate boulders on top of one another, which might have been easier to move than the study supposes. But at the same time, he argued (like Hearty does) that the rocks come from an older and lower cliff face, rather than the cliff edge - making them even harder to move. "It means that the flow velocity required to lift these boulders must be greater than that calculated by Rovere et al," Kindler said. Asked about what it would mean if the rocks indeed came from farther below, Rovere answered that "we would probably need higher flows." But he added that "based on what we observe basically everywhere in the Caribbean, there is no other evidence that a boulder has been taken from the base of even a small cliff and brought up, surpassing an entire cliff." Clearly, the origin of the boulders remains debated. Nobody, though, seems to be contesting the main punchline of the current study - as seas rise, so do our risks from damaging ocean waves hurled by storms. "If you raise sea level, you will have more energy on cliff and coastal barriers," said Rovere. "That's the real problem we will have to deal with if sea level keeps rising."